Conductor, Music Educator, Scholar, Author, Director of Choral Studies at the University of Toronto (U of T) --- these are all roles which Hilary Apfelstadt has seamlessly integrated into her life. At the Podium 2012 conference, Apfelstaft’s University ensemble, the MacMillian Singers, performed a joint concert with the Elmer Iseler Singers and she discussed with me her experiences within each of these different roles. While Apfelstadt enjoys conducting a wide range of ages, she confesses that she loves working with University students because “they are still teachable and in the teaching process they have enough knowledge that they can contribute… it is very collaborative.” A recurring theme in our discussion is the concept of education because Apfelstadt first and foremost sees herself as a music educator. She exudes no air of conductor superiority. Upon entering her position at the U of T, Dr. Apfelstadt saw her role as someone who would create opportunities for music educators. This is seen in Apfelstadt’s reconfiguration of the choral ensembles at the U of T. The number of choirs has been increased from three to four and the focus is on building the importance of the mens choral experience. The ensembles are also unique in that two of the four choirs are run by doctoral students and each doctoral student has a pair of masters students working with them. A powerful and challenging collaborative learning model. Apfelstadt states that this framework serves two purposes: to provide a good choral experience for those who wish to sing and to provide a pedagogical framework for budding conductors. 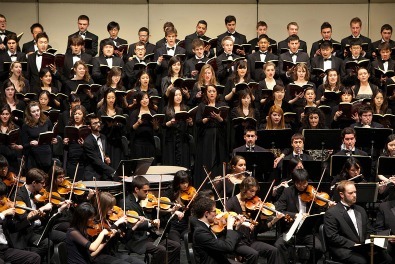 Recognizing the importance of creating community connections for her students, Apfelstadt has also increased the number of collaborative projects with community ensembles, high schools and professional ensembles like the Elmer Iseler Singers for Podium 2012. She stresses the importance of these connections because it allows her students to realize that they can integrate themselves into the music community once they finish their studies. In addition to her roles as a music educator and conductor, Apfelstadt has written numerous articles on choral music and contributed two chapters to “Wisdom, Wit and Will: Women Conductors on their Art.” While discussing how she came to be a contributor, Apfelstaft half-jokingly stated that 'when Joan Conlon asks you do to something, you say “Yes, Ma’am!”' Brushing this jovial sentiment aside with a smile, Apfelstadt elaborates that the topics she discusses in the book include leadership styles and balancing the personal and professional aspect of life for women conductors. Apfelstadt states that interesting comments from readers have told her that they found the book was applicable to all conductors and not just women conductors. I realized that every good teacher always has memorable tokens of wisdom. Apfelstadt was no different. She offered some excellent advice for budding choral conductors: “Get out there and find every opportunity to do everything. Even if somebody offers you a church choir job with 6 people in it, get out there and learn how to work with those people.” Her wisdom can be extended to any personal pursuit. I can see how she has mentored so many with her reassuring tone and supportive nature. It is clear that her students are well looked after.